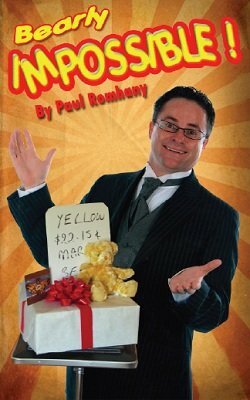 This has been the opening routine for Paul's Mentalism show for corporate events and cruise ships. Included are two different methods, one for stage and the other for the solo performer. Includes diagrams of props, the complete script and full instructions. The magician shows a gift box, and talks about how he bought this gift for his four-year-old niece for her upcoming birthday. He then talks about 'coincidences' and wants to try an experiment. Audience members are asked to call out any color, any amount of money, a ladies name and a 'gift' is selected. The selections are written on a whiteboard. The lady is invited on stage and she takes out of the gift box a birthday card addressed to the magician's niece whose name matches the one called out … coincidence ONE. She then takes out a gift certificate for the exact amount that was called out … coincidence TWO … she then reaches in and takes out the gift which matches her choice and it is the exact color that was called out. 1st edition 2011, 34 pages.